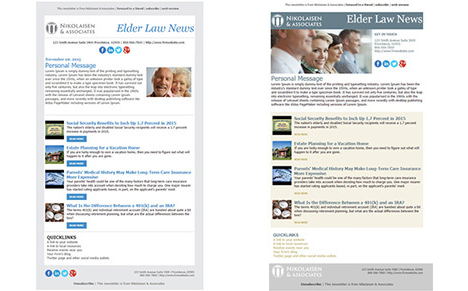 Let ElderLawAnswers design your next e-newsletter. Just send us your firm logo and/or a photo of yourself and we will create an E-Newsletter design for you that you can use anywhere you want. We will even throw in a 30-day trial so you can try it out on your clients and referral sources. 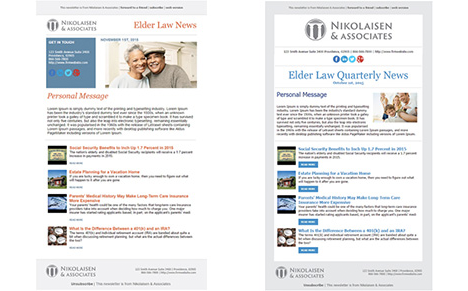 E-Newsletters are one of the most cost-effect methods available to connect with the clients and refferal sources. But, designing and writing articles for them can be time-consuming. ElderLawAnswers will do it for you. Build memorable emails to greet your referral sources. With 8 beautiful new layouts, 8 professional themes and an easy-to-use editing tool, building an E-Newsletter is now easier than ever. Provide your referral sources with the information they need. It&apos;s now easier than ever to search our library and choose from thousands of articles. With unlimited lists and more flexibility to segment, your marketing will be more personalized than ever. Connect with the right people, with the most relevant content. Want to personalize your email? Write your own article and feature it in your e-newsletter. Drive traffic to your website. 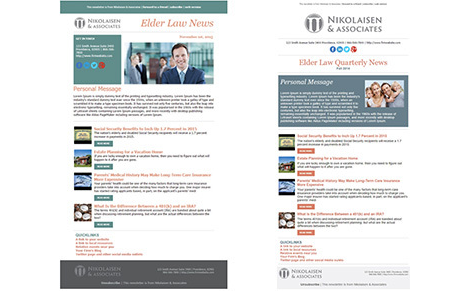 Feature your own articles in your e-newsletters. Capture the attention of new referrals with original content and our subscription form right on your own website. 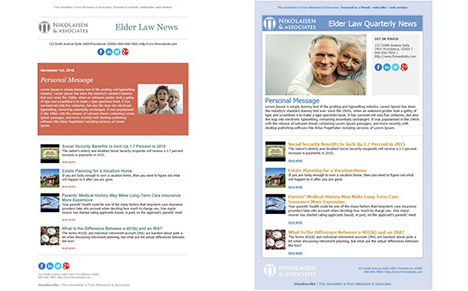 * This offer does not include management, hosting or support of the Client E-Newsletter provided with membership in ElderLawAnswers beyond the 30-day trial offer.